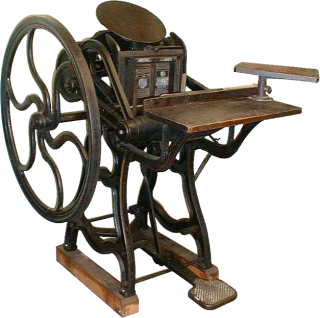 Joseph Watson began manufacturing the Samson press in 1885 in New York. The No.2 pictured is an Oldstyle model, which was followed in 1895 by an Improved model. The Improved, which included an impression throw-off, was made in two different grades, the first and better of these having more steel parts than its cast-iron sibling. Gears on the Improved tended to be cut rather than cast, like those on the Oldstyle. The Samson was made in seven different sizes ranging from 6″x10″ to 14 1/2″ x 22″.